Four years ago I was 1 of 3000 people who applied for an audition for a science fiction TV series. From there I went through two auditions and was one of the lucky 18 to get cast. 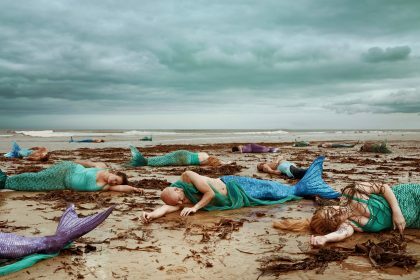 The final cast came from all over Britain to create Chronicles of Syntax, the vision of Yorkshire writer Susan E Clarke. It has been a long process since then to get to the stage we are at now. Including a two week intensive stage fighting course including the scariest and most energetic exam I have ever taken in my life!….swords, daggers, and acting. Four years later we have managed to raise the money to film the first six episodes through an Indiegogo campaign thanks to the generosity of our supporters and fans, who are now nicknamed #COSfamily and who come from all over the world. We seem to be very popular in America and Canada. 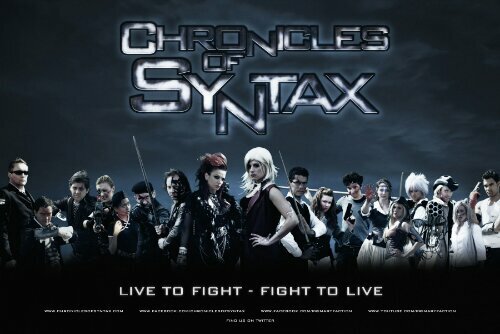 To top that off, we have been taken under the wing of Channel Flip who have launched a new sci fi channel called ‘The Multiverse’ and will be showing the first six episodes of ‘Chronicles of Syntax’ starting with episode 1 in Jan 2013. If these go down well then hopefully Channel Flip will commission us to make the next six episodes…fingers crossed. The Multiverse is a new YouTube channel and is hosted by Warwick Davis – legendary star of films such as Harry Potter, Star Wars, Hitchhiker’s Guide and Willow and will be the Home Planet of Scripted Geek Entertainment. Anyway, here are a few details about Chronicles of Syntax… Somewhere within the Earth’s population is a selection of people, each of them unique, holding traces of information locked deep within their DNA. These people do not know who they are or what latent powers they possess. They have, however, been chosen to make a difference in a war that will see the forces of good and evil battle for their allegiance. Set in present day Britain, season one of Chronicles of Syntax revolves around Sian, one such individual, and her work for the Fallen Angel Network (F.A.N.). This secret government facility is charged with finding a way to stop the oncoming apocalypse. Sian is tasked with the burden of finding the right people for her team but they do not remember ever being chosen and making allies in a world where good and evil are not so easily told apart can have fatal consequences. Only when she gathers all the members of her team can she access memories sent back through time to save the future. With the countdown to the end of the world under way, the team must unite to have any hope of avoiding it and survive an enemy hell bent on stopping them. The show will appeal to the Dr Who and Buffy fans amongst us. As part of the launch iDare productions is releasing a character profile every few days over December and January as part of COSmas. I’m still excitedly waiting for Kelly Day (my character) to come! As well as getting to be in a Sci-Fi series it is like we have become a little family having worked so hard for the last four years together to make this project happen. Check out our trailer on the Multiverse we would love to know what you think. Previous Post:A Weekend Without WWW?